Please feel free to peruse our beginner’s guide to UK Airsoft – this is a complete overview of our guide, if you are wanting to forward to someone a particular section, individual pages of the guide are available. Airsoft skirmishing, often referred to as simply ‘airsoft’, is a live combat simulation in which two or more teams are pitched against each other in a game of fitness, skill, determination, tactics, psychology and wits. Players battle with each other with replica firearms which fire small, light plastic pellets at high speed (usually firing around 15 BBs per second and up to 350 feet per second muzzle velocity). 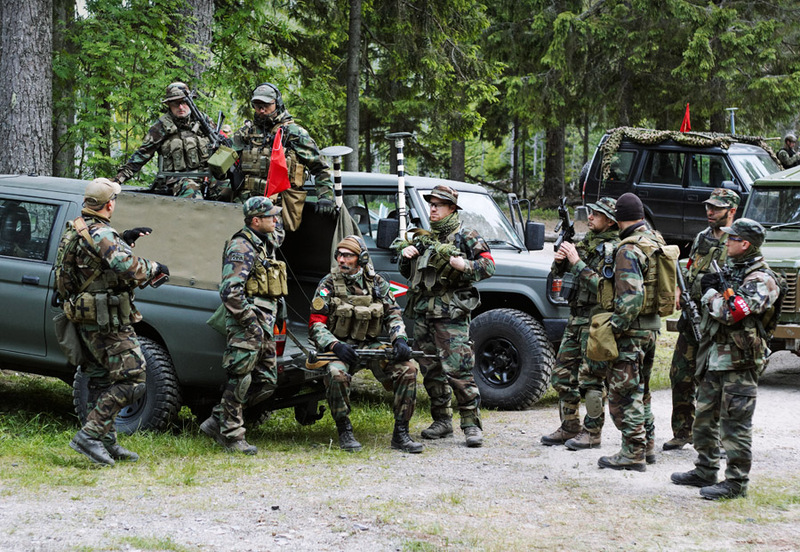 The realistic playing area, mission, equipment and clothing all add to the intensity and suspension of disbelief; in an airsoft game you can get a genuine sense of a real battlefield. If you have ever wanted to play out the excitement of a war movie or computer game for real then this is your chance! Airsoft is excellent fun but it also builds confidence, fitness, teamwork, introduces you to new friends and most importantly gets you out of the house. Airsoft is the perfect answer for the modern British lifestyle; it allows you the rare opportunity to release pent up energy, escape the pressures of everyday life for a few hours and gain a sense of community. These positive ideals of discipline, physical exercise and team spirit far outweigh any concerns over simulating real firearms. This guide has been written by the players that run United Kingdom Airsoft Players Union, so all of the information in this guide has been gleaned from decades of first hand experience. It has been written to help new British players get involved in the airsoft hobby. The survival of any sport or pastime is dependent on the continual induction of new enthusiasts. Most players know this and are more than happy to welcome and advise beginners. The British airsoft scene is bigger than it has ever been, but with anti-gun sentiment in the media, convoluted laws and a public which is wary of anything firearm related, new players can find it is difficult to get into the hobby. Much information in this guide will be of use to new players from outside the UK, but please bear in mind that the emphasis is on helping people get into the British skirmish scene. Surprisingly, airsoft is a relatively cheap hobby to get involved in, especially when compared to other outdoor activities. Enough ammunition for a full days play (about 3000 BB’s) will cost £8-£12, and a very effective airsoft replica (a Chinese ‘clone’ AEG) can be bought for £150. It usually costs £20-£30 for admission to a day game. To rent a replica and face protection usually costs another £20. For such a fantastic full day out this is a very favourable cost. All you need to turn up with is some dark or military-style clothing and we recommend being study boots with ankle protection as well as gloves. When you get into the hobby you could easily find yourself spending thousands each year on posh replicas and kit, but this is personal preference; in reality skill will always win the day and this high end equipment only gives you a marginal advantage over someone who has spent the bare minimum. The core of airsoft is honesty. When you are ‘dead’ you count as having been killed or incapacitated so that you may no longer participate in the battle until ‘re-spawned’ or ‘tagged in’. You must shout “HIT!”, raise your arms and return to the respawn point, where more often than not you will be able to rejoin the game after a period of time, meaning new players needn’t worry about being killed early in the game and spending the day sat around like you often do in paintball. Sometimes you must stay ‘dead’ on the spot until healed by a ‘medic’. Other times you will have to wait for the next game to play again. Respawn points (where you rejoin the game from after being hit) and medics can also be combined with allocating the player a limited number of ‘lives’. All rules are at the discretion of the game organiser and you’ll come across many variants and combinations, which keeps the games different and interesting. The most common way of being ‘killed’ is when a BB fired from another person’s airsoft replica strikes your body. It does not count if it rebounds off of another surface, but a direct shot always counts. Whether it hits you hard or soft, or hits kit or limbs or armour, it’s all the same, you are dead. Another way of being ‘killed’ is by pyrotechnics such as booby traps, simulated artillery or more commonly, grenades. Airsoft grenades are usually thrown devices which detonate a blank cartridge or are small single use pyrotechnics produced for airsoft, which you purchase on site for about £2.50 each. If you are within a set radius of an explosive when it detonates, you are out. You will be informed of the radius by the marshals before the game begins, but is usually 3 meters. In a building, a grenade will usually count as eliminating all of the people in a room regardless of distance or cover. Smoke grenades are available, when ignited these produce a cloud of smoke which you can use to cover yourself from enemy sight. One of the first things people want to know about airsoft is how much it hurts. The amount of pain you receive from a hit is totally dependent on your distance to the firer and where the BB hits you. If hit on exposed skin at close range it won’t penetrate your skin but it can draw blood, leave a red mark or really sting! At longer ranges you can be hard pressed to even tell you have been hit so must become aware of what a light hit sounds and feels like. Most of the time a hit to a vulnerable area feels like getting whacked on the skin by a rubber band; quite a sharp pain that can make you jump, but fades almost instantly, certainly a hit which you are still aware of a minute later is unusual. Unlike paintball, airsoft will not leave huge sore bruises. You will find that having to “take the initiative” and charge into an enemy position in the face of potentially painful return fire is what makes airsoft feel a thousand times more real than playing a computer game! It’s not unheard of for people to suffer broken bones or impact injuries from falls but this is only to be expected in a high intensity game played over sometimes arduous terrain. Injuries are far less common than in mountain biking or football, for example. Airsoft game organisers do make every effort to mitigate risk, as such injuries are rare but when it comes down to it airsoft is an arduous outdoors sport that favours tough people! A good standard of fitness in airsoft will certainly help you to win games. There are many people who are concerned that they might be too unfit to play airsoft, but this is not the case. If you are struggling to keep up then you can always decide to hang back and defend a static position, or in the worst case scenario you can drop out of play for as long as you want to and take a breather in the safe zone. Plenty of unfit people come to games and of course they are improving their health every time they do so, even more so if they push themselves, so poor personal fitness isn’t something which should discourage you from coming along. 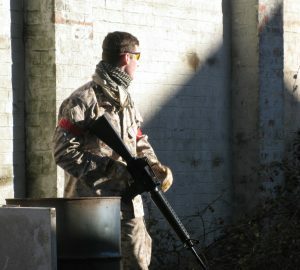 Airsoft games are limited only by the game organiser’s imagination. They can range from live action role-play, weeklong continual games, science fiction games, fighting off zombie hordes, to bank robberies, historic re-enactments, full simulation of modern operations and everything in between. UK sites commonly play 40 minute games with a set objective to hold or retrieve and a start/respawn point for each team. 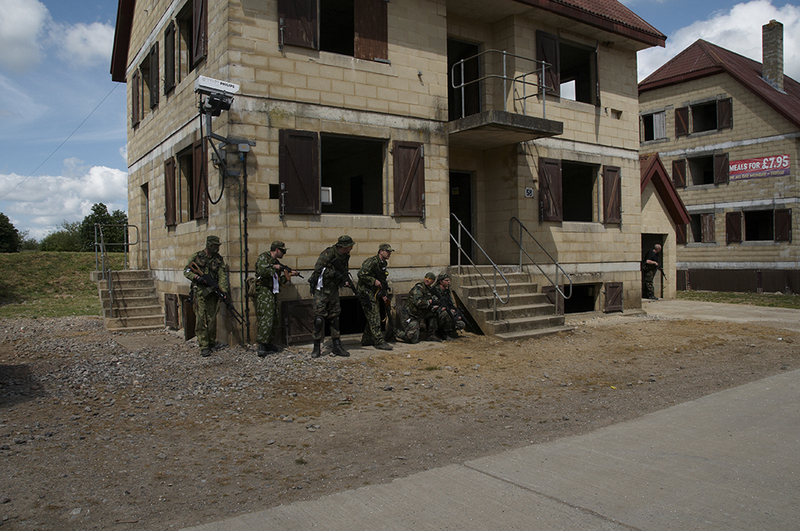 As it happens the UK has some of the highest standard of airsoft sites in the world – lucky you! 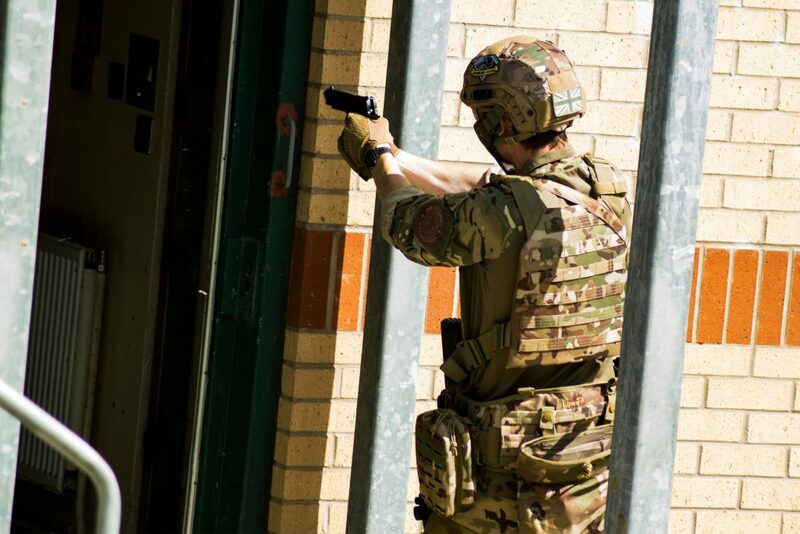 Even in the US and Hong Kong, where they have very well founded airsoft communities, they consider British airsoft games to be some of the best. So when you turn up at a UK site you can never really know what the game organiser, and the enemy team, has in store for you! Organised game areas are almost unlimited in their scope and terrain. Traditional ‘woodland’ sites are usually based in a private wooded area in the countryside, with a few temporary structures and objectives to fight over. 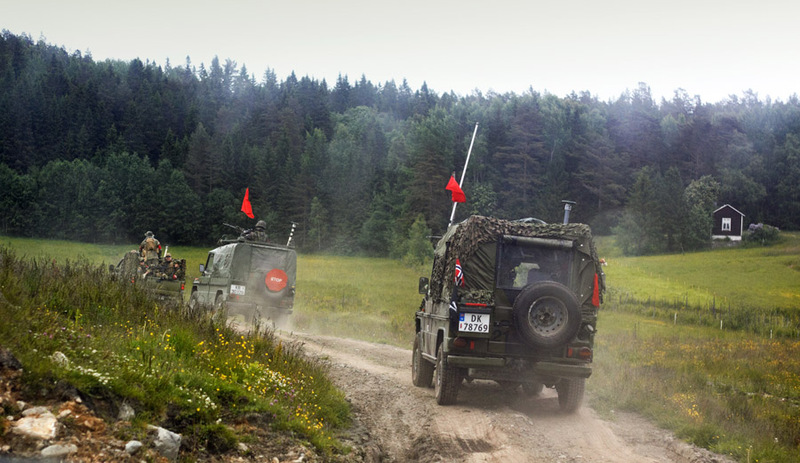 Woodland sites can become muddy and sometimes involve arduous terrain, but offer great opportunities to blend into your surroundings and use field craft skills to outmanoeuvre and engage the enemy. You will also find ‘urban’ sites, which may be based in old warehouses, office blocks, hospitals, military camps, power stations or even nuclear bunkers. These require a different style of play, and some special equipment such as torches can be of great help. Most games will be typically held on a Sunday from 9am to 4pm. Games will very rarely be cancelled because the weather, so in this country you must always be ready to play in the rain and cold! There are over 150 skirmish sites in the UK, and this number is always increasing. Sites will either be operated by a team of local airsoft enthusiasts or a franchise that owns multiple sites and/or shops. Sites can be found throughout England, Scotland, Wales, Northern Ireland, and on the Crown Dependencies of the Isle of Man and Guernsey. There are sites available in nearly every European country, if you wanted to play abroad. Well run sites have public and employers liability insurance, toilets, water replenishment points, dedicated experienced marshals, a covered safe zone and first aid facilities. It is legal to organise your own game on privately owned land that is away from the public, but there are many laws and risks which have to be considered. UKAPU recommends that you play at organised sites, especially when you are new to the hobby and unaware of all the issues. If you were to make a mistake in organising your own game, which resulted in an injury or criminal charges, or offence to local people, then it could easily be picked up by the media and hurt the whole hobby. There are many dedicated airsoft retailers in the UK, some focus on on-line sales and others have physical shops. They may also also sell surplus, airsoft specific, after market or reproduction military gear. Have a look on the member benefits tab on this website for a list of great retailers who will provide UKAPU members with discounts and offers. The United Kingdom Airsoft Retailers Association (UKARA) is a body which represents airsoft retailers. They administer a database which you can be registered on once you have become a skirmish site member. UKARA retailers can then check this database when you want to buy a RIF (a Realistic Imitation Firearm), which upholds their legal obligation to ensure that they only sell RIFs to airsoft skirmishers. 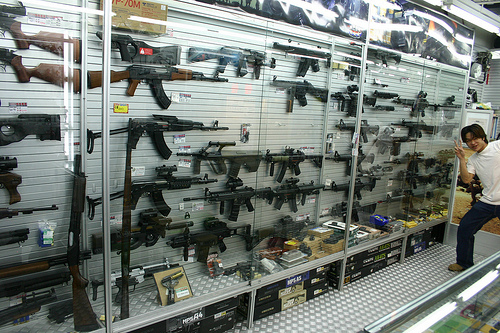 It is also common for UK players to purchase airsoft equipment from big shops in Hong Kong. Players often casually affiliate themselves with their local site and also form teams who play and fight together. Teams can be vary from being well drilled and with coordinated uniform to just a group of friends who go to games. 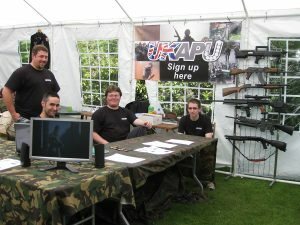 Players are represented by our organisation, the United Kingdom Airsoft Players Union (UKAPU). We stand up for players rights and allow their views to be taken into account. The media, government and public can be surprisingly hostile to airsoft and many people want to see airsoft banned for spurious reasons. UKAPU can and does successfully work to counteract this negativity, but we are only strong when we have lots of members, which is why we ask that you join us when you start playing. Since you’re here, reading an article on the UKAPU website, why don’t you consider joining once you find your feet? Another important part of the UK airsoft community is the web. There are half a dozen large web forums, some popular news sites, Reddit and Facebook communities. The large amount of traffic on these web forums can be deceiving; in actual fact the large majority of airsoft players don’t use them. Even so, they are a great way to find out about the hobby and research equipment before purchasing. Please view UKAPU’s links page for a concise list of great web links. 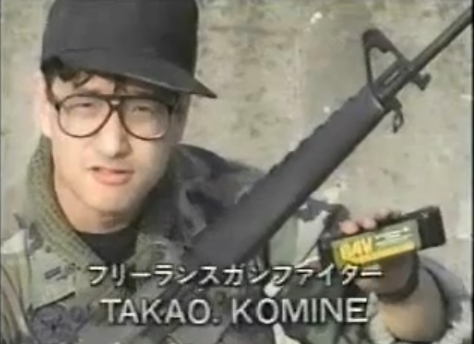 The honour based and high tech game of airsoft unsurprisingly came from Japan. In the 70’s they started using 6mm automatic airsoft replicas powered by external gas bottles as an alternative to paintball. The hobby’s popularity increased in Japan throughout the 80’s and several manufacturers started producing skirmishing equipment. In the early 90’s Tokyo Marui produced an automatic electric gun (AEG) that ran on radio control car batteries, the convenience and effectiveness of which opened the doors for airsoft to spread globally. The Hong Kong airsoft scene is one of the largest outside Japan and most airsoft trading around the world is done through the many HK warehouses and distributors. In the early 00’s other manufacturers began to copy Tokyo Marui’s AEG design. 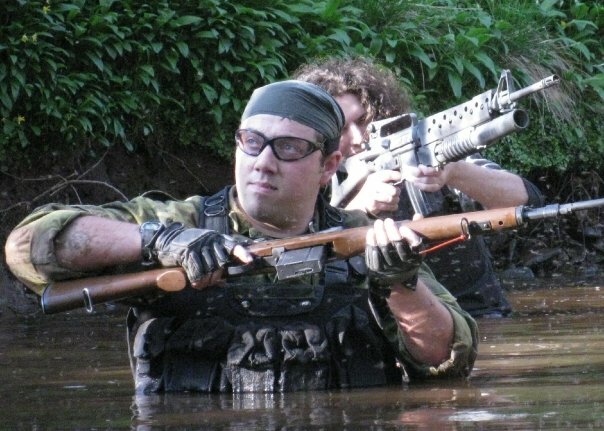 This, plus advances in computer design and production techniques, has allowed Taiwanese, Chinese and Japanese manufacturers to turn out a bewildering array of airsoft replicas to suit all budgets. If you can think of a real gun, there is probably an airsoft version or conversion kit available to replicate it. Airsoft had been played somewhat under the radar in the UK since the early 80’s, but in the mid 90’s lots of organised sites were created, the profile of airsoft increased and since then the hobby has grown at an exponential rate, despite hostile legislation. Chances are you are very keen to buy an airsoft replica (if you have not done so already). In 2007 a bill was enacted called the violent crime reduction act, or VCRA. Before this act you could walk into a shop and buy an airsoft replica. Now things are a little more complicated but RIF’s (Realistic Imitation Firearms) are still available to almost everyone, if they get involved in airsoft. A few sections of the VCRA focus on banning the sale and purchase (but not ownership) of RIFs, a category which includes realistically coloured airsoft replicas. After the airsoft community won the long battle against the government and because the abuse of replica firearms was nothing to do with replicas sold to airsoft skirmishers, the government allowed airsoft skirmishers and a few other groups a ‘specific defence’ against the act which allowed us to continue buying RIF’s. So if you are a skirmisher, you are allowed to buy airsoft replicas without restriction. You can get them from retailers in the UK, import them from overseas and buy them from to fellow skirmishers. There are a number of interpretations as to what a skirmisher is. The most commonly accepted and safe method of becoming one is to attend 3 games at the same site over a time period of more than 2 months (so all 3 games can’t be within 2 months). Once you have done this, you may become a member of that skirmish site. To register on the UKARA database you must do the above at a UKARA registered site. You can send an application form off to a UKARA retailer once it has been stamped by your site and you will then be placed on the database. You can then purchase airsoft replicas from any UKARA retailer as they can instantly check that you are a site member by logging in to the database. UKARA registration is absolutely not mandatory for those wishing to buy RIF’s, but it there is no cost to add your details to their database (not to be confused with the membership fees which are charged by your site, if any). Just remember, site membership is the only thing that counts legally speaking, UKARA registration is meaningless in law. 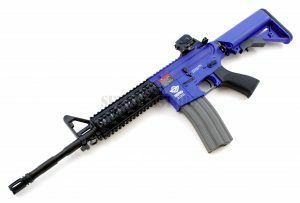 Buying your first airsoft replica from a specialist UK airsoft shop is a good idea as they can help you pick the right replica and you are legally entitled to a refund if it is faulty and breaks within the first few games. Many shops will sort new players out with a starter package of magazines, batteries, a charger and a mask so be sure to ask them if they will do you a special deal. If not, shop around (remember to have a look at the list of shops which provide UKAPU member discounts and offers)! Skirmishers can import airsoft replicas from overseas shops, but you must be able to prove that you are an airsoft skirmisher. UK Border Agency are able to check the UKARA database but if you are not registered with UKARA then Border Agency will often check directly with the owner of the site of which you are a member. Second hand airsoft replicas can often be bought from web forums and at sites. These are, more often than not, in good condition and can be bought for a significant reduction from the new price. Again, the seller can ask a shop to check the UKARA database, but the verification which the seller will accept is entirely their decision. The seller could face criminal charges if they sold the RIF to a non skirmisher. Verifying entitlement to the specific defence is something which must be taken seriously. Many excellent second hand replicas can be found on the web forums listed on our links page. Buying a replica at a playing site is easier than doing it over the internet as the seller can see you playing a game and can see that you are buying it to use in a game, so they don’t won’t require further verification. Keeping a diary of games you have attended, signed by the game organiser, may help to prove that you are a skirmisher. It certainly doesn’t hurt to have your own paper record to refer to. A ‘skirmish diary’ is also a nice record to keep. If you are not yet a skirmisher then you are able to purchase ‘IFs’, which is an imitation firearm. IFs are regular airsoft replicas, but with the bodies painted in a bright colour or with a transparent body. These are often called two-tones. Once you are officially regarded as a skirmisher, you are allowed to paint them a realistic colour, or replace external parts with those which look more realistic. As you only have to attend 3 games, during which time you can make an informed decision about which replica you want, it is a much better idea to put off buying an airsoft replica until you are allowed to buy a RIF. If you are under 18 you cannot legally purchase a RIF or IF, no exceptions. You can however, at any age, legally be given a RIF as a gift by an adult who is entitled to the specific defence. You can also be gifted an IF by an adult who is not entitled to the specific defence, hence the trend for younger players using IF’s gifted to them by non skirmishing parents, to avoid having to hire a replica until they turn 18. Under 18’s are allowed to ‘manufacture’ RIFs once they are entitled to the defence, that means to say that they themselves can paint their two tone black once they have become a skirmisher (many sites have junior membership schemes). Being a member of the Police or armed forces changes nothing as regards the VCRA if you will be purchasing them for private use at skirmishes. Firearms licence holders are also no more entitled than anyone else. The exception is if they are being purchased by a law enforcement organisation for training purposes. UKAPU members are encouraged to send an email to one of the addresses on our contact page if they are still unsure of how to comply with the VCRA. In England, Wales and Scotland, with the commencement of the Policing and Crime Act 2017, the Firearms Act 1968 has been amended to define maximum power levels that Airsoft replicas are allowed to have. Exceeding any of these limits could ultimately result in a prison sentence, depending on what has been exceeded. In Northern Ireland, there is no specific exception for Airsoft – in this locality the maximum is 1J (as in Japan, Italy), although it is the intention of UKAPU and other organisations to resume lobbying/campaigning for a 1.3J/2.5J once the Stormont crisis has been resolved. Most importantly to us skirmishers, it is an offence to brandish a replica firearm in a public place, or leave it in a place where it may be seen by the public. This still applies if the general shape of the replica can be deduced through its packaging, which is a very good reason to buy a gun case (also this will protect it in transit). You can use the original box that your replica came in, but these are bulky and of course have a picture of a gun on the outside which must be obscured. When transporting an airsoft replica you must have a valid reason to have it in public (even when it is fully covered). Taking it to a game, or to a shop to fix it are examples of valid reasons. You should carry the contact number for the airsoft game manager so, if you are stopped, the police officer can verify that you are on your way to a game. Showing a replica in public will cause alarm and will help the people who want to ban our hobby. Needless to say it is a criminal offence to fire an airsoft replica at a non consenting person, or at an animal. You will also more than likely be banned from sites and ostracised from be a source of mockery for the community. 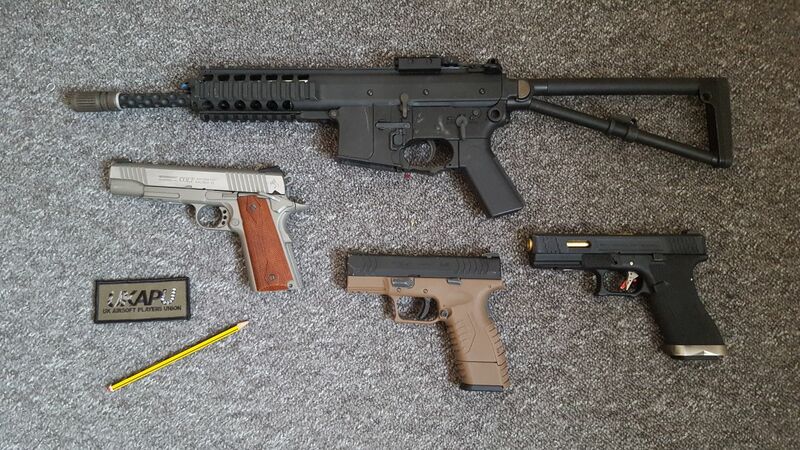 It is not illegal to display your airsoft replicas in your house, but if they can be seen through a window it could lead to you being reported to the police by a worried passer by, or you house being burgled and your equipment stolen. If you have a run in with the Police which involves airsoft replicas it is quite possible that they will be ignorant of airsoft related law. Sadly, poorly conceived new laws are introduced by politicians at a fast rate and often officers are not adequately trained on how to implement them. It is however extremely rare that skirmishers draw the attention of the Police through legitimate activities. When police officers do get involved they are highly likely to be amicable and fair if you are cooperative and polite in return. If you do find yourself unfairly persecuted, which does happen, get in touch with UKAPU. We can’t always find time to help non members, but we always have our members backs. All of the above laws apply to IFs (two tones) as well. They may look like toys but they are not toys in the eyes of the law. If you would like to learn more about said legislation, please feel free to have a look at our Legislation FAQ, or if you would like to see formal definitions of the laws that cover Airsoft in the UK, please refer to our collection of legal documentation. There are 4 main types of airsoft replica available, known as spring, electric, gas and high pressure air. The vast majority of airsoft replicas are loaded with ammunition via magazines, in the same manner as real guns. Most modern airsoft replicas have the power system mounted internally so there are no wires or pipes connecting you to the replica and hindering your movement. The most basic are spring powered replicas. They use a hand operated mechanism to pull a piston against spring pressure and lock it back, whilst loading a BB into the hop unit. The trigger releases the lock and allows the spring to push the piston through a cylinder, rapidly expelling the air inside the cylinder through the hop unit and accelerating the BB down the barrel. This category includes cheap single shot pistols like the two tones you will see in hobby shops, but also include skirmishable weapons, such as shotguns and sniper rifles. 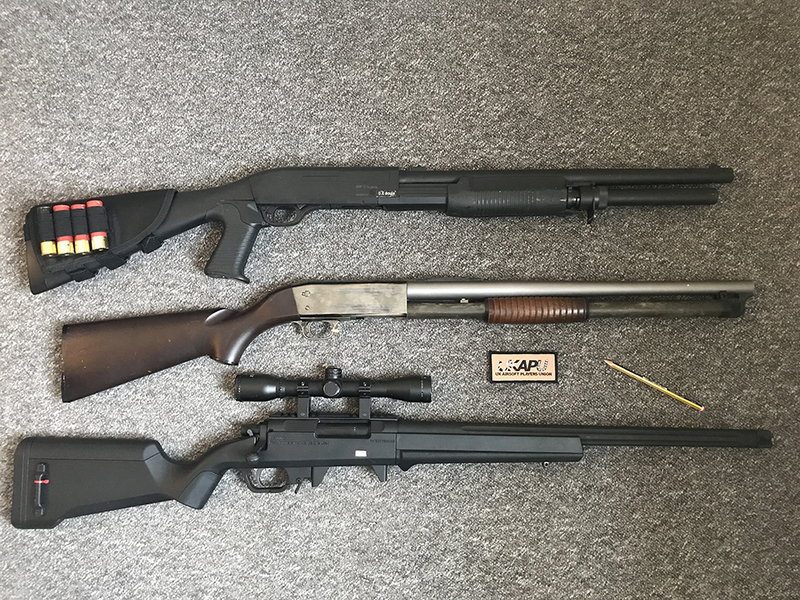 Spring shotguns are a viable alternative to an AEG, they can be effective and fun to use but require a higher skill level than automatic replicas. Sniper rifles are the most common spring weapons found at skirmishes. These may fire BB’s to the same or greater range than a regular airsoft replica, depending on many factors, but the main reason to use them is that they can fire with greater accuracy than other airsoft replicas. It is advisable to forget about sniper rifles until you are able to use an AEG well. 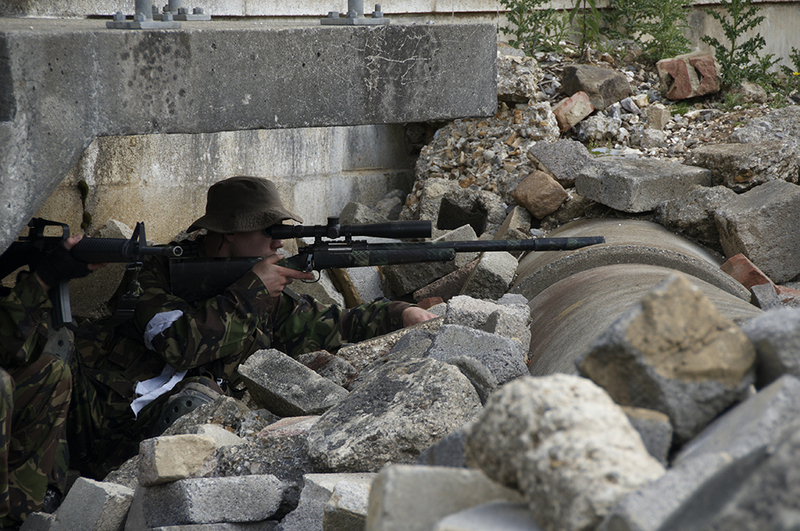 Most new players harbour a fantasy of being an elite sniper, but new players will fail miserably if they try and learn how to use a bolt action weapon before they have the skill to use an assault rifle in airsoft. The most common replica found at skirmishes is the AEG, automatic electric gun. These are powered by a rechargeable RC car/plane type battery. They operate in the same manner as a spring powered replica, except that the piston is pulled back by a set of gears driven by an electric motor. As such the only input required from the player to unleash fully automatic fire is a pull of the trigger. They all have safety catches and most are capable of firing in fully automatic and semi automatic modes. Some can fire bursts of 3 or more rounds. They are simple to use and cheap to run, requiring you to simply recharge the battery at the end of the game day. Most are very reliable and low maintenance. These factors make AEGs by far the most popular type of airsoft skirmish replica. Nearly every well known assault rifle or sub machine gun in the world has an AEG counterpart available. Typical AEG’s have a range of about 40 feet and fire 15-20 BB’s per second. Electric pistols also exist and function in the same fashion, but they are relatively low powered. Gas weapons store compressed propellant gasses and use a series of valves to release the gas into the hop unit. The BB is then propelled up the barrel as the gas expands. The gas is often contained in the magazine so that a fresh charge is placed into the replica at the same time as the BB reload. Gas weapons do not function well outside of British summertime as the gas will be at lower temperature (and thereby pressure) than was expected by the airsoft designers in East Asia. Gas weapons can also suffer from leakage in the magazine seals and require regular cleaning to function properly. Gas enthusiasts assert that the increased realism of the gas weapons function and its instant trigger response make up for these shortfalls. The most common type of gas weapon is the gas blowback (GBB) pistol. These appear to function like a real pistol, the top slide moves sharply back when the trigger is pulled and you feel a certain amount of recoil. You will also see GBB rifles, which are less practical, more expensive and generally less reliable than AEG’s but offer an enjoyable firing experience. You also find 40mm ‘grenade launchers’, often mounted under an AEG, which fire 24-1000 BB’s (dependant on size) in one shot from each grenade shell. These are only really effective in close quarters but the weight of fire will certainly intimidate your opponent! Gas sniper rifles, non blowback (NBB) gas pistols and gas shotguns are also available but are less common. The different propellent gasses available are commonly divided into 134a (lower power), green gas (higher power, increased strain on replica) and red/black gas (even higher power). Gas can be bought from shops or at the playing site. Different replicas are designed to use different power gasses. Some players use propane (normal camping stove gas) by using a special airsoft adapter on the can. Any good airsoft replica is fitted with hop up. This clever mechanism is a chamber which forces an adjustable amount of backspin onto a BB when fired. When hop is correctly adjusted the BB will fly in a straight line for a long distance until it loses momentum and drops to the ground very quickly, rather than dropping in a constant arc over distance. Unlike a paintball marker you do not need to aim up and lob your shots onto your target, you can shoot straight and use the weapon sights (or even use a telescopic scope) to make accurate shots. Airsoft replicas can be fitted with standard or mid capacity magazines, which feed 60-150 bb’s, (dependant on mag size), via a spring, like a real magazine. They are loaded by putting BB’s in the top of them with a loading tool. Mag capacity is often proportional to mag external size, so a larger calibre weapon like a 7.62 G3 has an airsoft mag that holds more than a small calibre 9mm MP5 mag. Some players prefer mags which hold the same number of BB’s as the real thing, known as real cap mags. Gas weapons use standard type mags but have a reduced capacity as some of the space in the mag is occupied by the gas reservoir. The most popular mags for AEG’s are high capacity magazines, which hold a reservoir of 200-600 BB’s and feed them via clockwork style mechanism. ‘Hi-cap’ magazines are loaded by pouring BB’s into the opening at the top and require the player to wind the clockwork spring via a wheel on the bottom. Closely related to Hi-caps are drum or box magazines, which are often found on support weapons. These utilise the same mechanism as hi-caps but have a bigger reservoir of 2000-6000 BB’s. Some of these magazines wind the feed spring by an electric motor. The stock or fore grip of an AEG usually contains the battery. 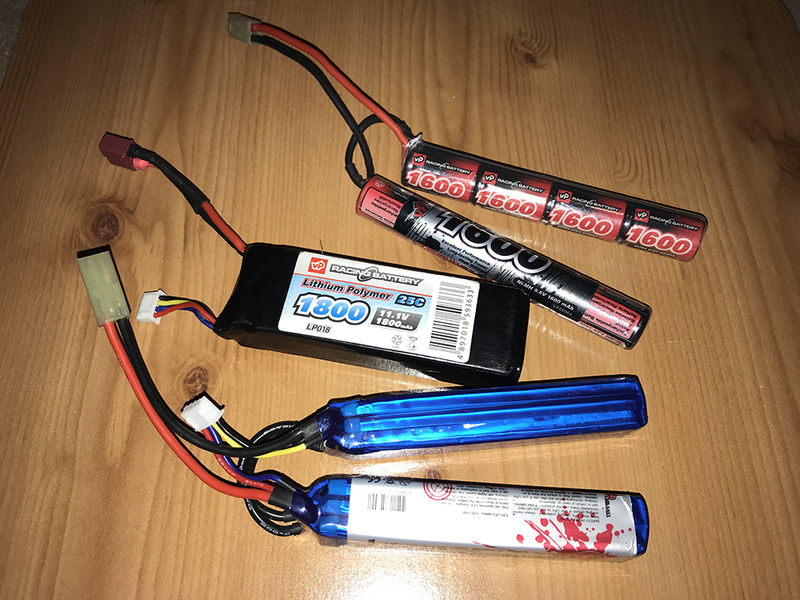 The physical size of the cells in your battery usually determines how much charge it is rated to hold and thereby how many times it will fire your replica before it runs out. Charge capacity is measured in milliampere hours (mAh). The number of cells determines the force that the replica can extract from that battery at a given time and thereby determines rate of fire and trigger response (measured in volts). NiMH (nickel-metal hydride) are the ‘standard’ batteries which require a basic charger and are very safe to use. The disadvantage is that the large NiMH batteries are bulky and require a large space inside the AEG to store them (such as inside a solid stock). Small NiMH batteries overcome the size issue but do not last for long so you will find the battery will run out after 1000 rounds or so and you have to swap it mid game. AEG’s are usually designed to run on 8.4 volt NiMH batteries. Lithium battery types (Li-Po, Li-ion, Li-Fe etc.) have combined the size of mini battery with a capacity of a large battery. Lithium batteries are somewhat volatile; if they are incorrectly charged or shorted out or punctured they will rapidly ‘balloon’, discharging noxious gasses and enough heat to start fires and melt plastics. As long as you are careful when handling the battery, plus you buy a quality battery and a quality charger with a cell balancer, you are unlikely to experience any problems. Lithium batteries will be permanently damaged if you run them till empty. You can fit an alarm in your replica which lets you know when your battery has dropped to critical capacity. As well as volts and milliampere hours a li-po battery has a C rating, the high C rating cells have a greater ability to satisfy rapid peak power demands. Do not make the mistake of thinking that AEG range is affected by battery or motor power, only rate of fire and trigger response is affected. The spring moves the piston forward at the same distance at the same speed and is not related to the force supplied by the motor. Some AEGs use a ‘proprietary’ battery, which is to say that the shape of the battery must be tailored to the space available in that particular replica. Most skirmish quality ammo (BBs) is similar but you must always use skirmish quality ammo that can be bought from airsoft sites and shops. Sometime you can find cheap ammo in supermarkets and high street shops, but you should never use this as it will almost certainly jam in the barrel of a good quality replica, and can cause damage as a result. Some brands of skirmish quality ammo will still give erratic flight paths and some brands do not feed from magazines very well, but if you ask your fellow players you will soon find out which good brands are available and cheap at the moment (it changes year by year). You can always buy ammo on site but will be more expensive than if you buy it in bulk from a shop. Never ever reuse ammo that has been fired already; even if it looks undamaged it will have internal cracks and is likely to break apart in your replica when you try and fire it. Different weights of ammo are available but stick with 0.20g or 0.25g BBs; heavier ammo doesn’t really help you when using stock replicas at UK power limits. Airsoft BBs are available in anything from 0.12g to 0.50g. 6mm is the industry standard but a handful of 8mm replicas exist. AEG’s are almost always 6mm but may be advertised with 7mm and 8mm gearboxes. This is the size of the gear axle bearings and not the ammunition used. Most airsoft replicas can be fitted with internal upgrades which may enhance the durability, rate of fire or range. Players will absolutely not need upgrades to be competitive and they can be hard to fit. In addition a new replica will be reliable for a long time if you do not mess with the internal parts, so for those two reasons we recommend that you forget about upgrades until you have been playing for a while. You don’t need a replica right away and won’t be able to buy one right away either. We suggest you go to a site, rent a replica, ask people if you can look at theirs (they will often be keen to show off their shiny toys!) and make a decision based on first hand information. That said, you are probably browsing websites for your first purchase already! Guns are cool and playing soldier is fun, you want to own a replica firearm ASAP and there’s nothing wrong with that, but if you have a little patience you will be able to get an awesome replica as opposed to rushing in and having to buy one painted up like a child’s toy! Most importantly, you must enjoy the look and feel of your chosen replica! 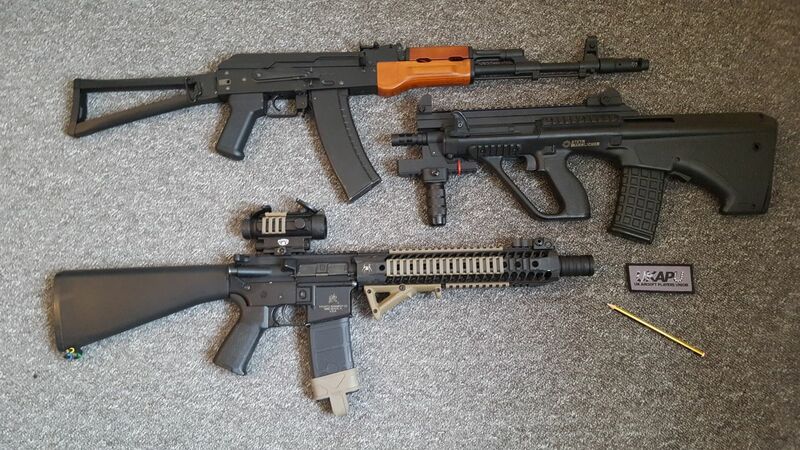 Most assault rifles and SMGs fit into the above requirements, such as AK47, G36, MP5, SCAR, bullpup rifles (rifles with the magazine behind the pistol grip) and M4. The quality of each brand can range from near perfect replicas to rough knock offs, and there are far too many brands to talk about here. If you can only afford a Chinese clone such as JG, D-boys or CYMA then that’s not a problem as more often than not they look good and the gearboxes are very durable. Be sure that any replica you purchase is under the legal limits for airsoft replicas in the jurisdiction you’re in, we recommend getting it chronographed at the shop when you buy it. If you’ve bought an airsoft replica, you are going to be keen to get it out of the box and loaded up so you can shoot up some coke cans in the garden! The vast majority of airsoft replica injuries occur in the home (as the editor of this guide will testify), not on airsoft sites, and that includes the loss of an eye on a few occasions. You can virtually eliminate this risk by setting simple rules and never making exceptions. Never insert the magazine and release the safety until you are completely ready to fire at a target. Never leave your replica loaded and unattended. Don’t ever point or fire your replica at someone who is not wearing protective equipment, even if you think it is unloaded. When firing in your back garden, be aware of overlooking neighbours who may be alarmed by seeing your replica. The shooter and observers should all wear eye protection in case of rebounding BBs (shooting against a draped towel will reduce mess and rebounds). Be aware that BBs may damage things like furniture, plants, plaster and glass. A few BBs often stay in the replica after removal of the magazine; it must be fired a few times in a safe direction after removal of the magazine, to clear them out. Never under any circumstances look down the barrel of the replica or hold the end of the muzzle when pulling the trigger. Pay particular attention to weapon safety when repairing and testing your replica as it is very easy to lose track of the safety condition after a jam or breakage. Do not trust anyone with your replica when it is loaded if they have never been taught how to handle a firearm. The idea is that in the home you should treat an airsoft replica like a real firearm. The core concept of firearms safety is to always treat a replica as if it it is loaded and ready to fire. Stupid accidents will happen to all players who become too casual with airsoft safety. Also, always fire your AEG on semi-auto with no magazine fitted before putting it away. This resets the firing mechanism and will help prevent your spring being weakened over time. Your primary concern, the first item you should buy, is a face mask. Mesh goggles consist of a steel mesh which stops the BB and the only vision impairment is that the mesh makes the environment appear slightly darker. Lens masks and shooting glasses have a clear plastic viewing lens which allows greater visibility but tend to fog up during physical exertion. Thermal lenses and fan units in your goggles can reduce fogging. Not all eye protection you find in the world is BB proof so purchase eye protection rated for shooting, airsoft or paintball. Some ballistic glasses on some people’s faces will leave a gap which could let BBs in to your eye area so goggles may be preferable. As you are probably aware, incorrect/dangerous use of an airsoft replica will easily cause catastrophic damage to eyes, but what most people don’t realise is that they will also shoot out your teeth with ease. For this reason, and to prevent unsightly hit marks on your face, you should wear a full face mask. These sometimes have goggles with integrated solid lower face protection, or you can purchase a lower face mask (often mesh) which straps to your face to compliment your goggles. You can wear a scarf or soft mask over your lower face but this may still not slow a BB enough to save your teeth. It is fashionable to wear eye protection with no lower face protection as it looks more authentic, however if you play like this for long enough then the risk of losing teeth becomes much higher and shattered teeth are not an uncommon sight at skirmishes, even though it is easy to prevent and can be extremely painful. Also remember that you are provided with only one set of eyes – so make your safety purchases very carefully. It is advisable to pick up a pair of army issue assault boots, perhaps from a surplus store. Soldiers who use them daily criticise them for being uncomfortable, but you will probably be using them once a month so they will be entirely tolerable. Once broken in they will give you great traction and ankle protection and will last for years if cleaned and stored correctly. After market (non military issue) boots in the same price range as assault boots will barely last a year before they fall apart. Boots are worth the investment to keep your feet dry, warm, increase you grip and protect your ankles. 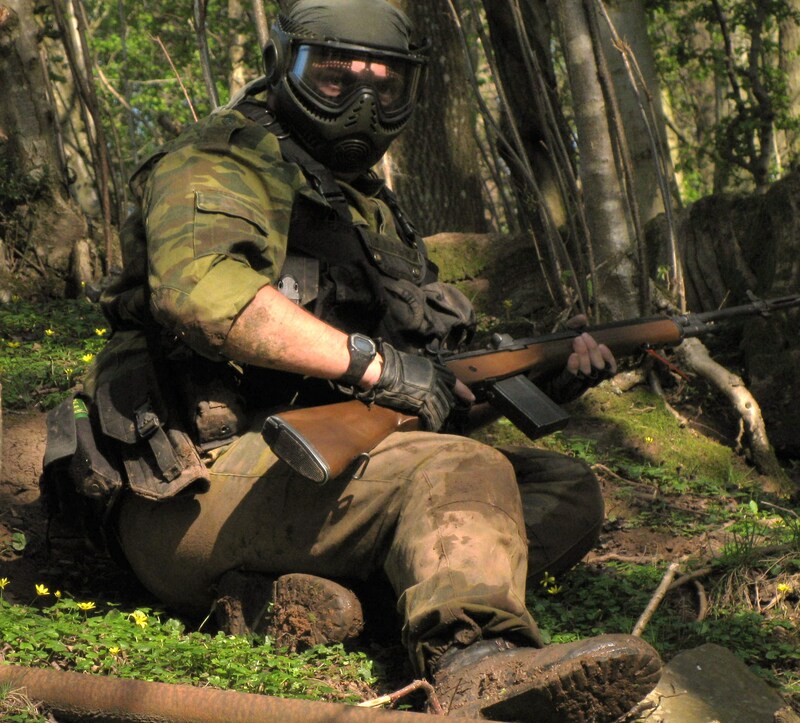 Trainers are a poor choice, especially in woodland games; they ruin your camouflage, look stupid and significantly increase the chance that you will sprain or break you ankle (painfully sprained ankles are the most common injury in airsoft). It is the same as buying a mask; if you buy a gun before you buy boots then you have made a big mistake. For you first few games a dark coloured hoodie and some old jeans will be sufficient, but the big attraction of airsoft for many people is dressing up in cool kit and generally looking like a badass. You can obtain the equipment and uniform of practically any army in the world, past or present, if you are willing to pay for it. You can even have your kit custom made. There are always sheep-like uniform trends which come and go but you are not obliged to wear anything in particular unless you go to an unusual scenario day where you have to represent a particular fighting force. You may be tempted to get a full set of uniform and kit before your first game but you may then find that your local site or you play style doesn’t fit what you had in mind, so it is much more sensible to get something cheap from an army surplus store and upscale your gear later on. The best stuff you can get in the UK is British DPM. It is cheap, hard wearing, good camouflage and comfortable. The market is flooded with excellent quality DPM due to the introduction of MTP to the British armed forces a few years ago. You should start by getting a shirt or jacket and a pair of trousers. If you are not buying a set of load carrying equipment (LCE) look for a jacket with pockets that you can put your spare ammo and magazines into. Assault vest: Covers your entire torso like a regular vest, maximising area available for pouches. Plate carrier: So named because they are designed to hold armour plates in the real world, these usually wrap around your waist and sides like a big chest rig with an additional small panel higher on your chest. In the last decade ‘Molle’ has become a firm favourite system for real and airsoft LCE. It takes the form of vests and carriers with no pouches; instead they are covered with horizontal loops of material at set spaces to which you attach special pouches. Pouches of every conceivable size and shape are available, these have matching loops and vertical strip of material which is woven through the pouch and vest loops. The end result is that you can constantly re-configure your entire LCE for personal preference or endlessly alter it to suit each game or weapon system. It is a good idea to purchase LCE in a solid colour such as black, brown or green. When you buy jacket/trousers in a new camo pattern you may then need to replace your LCE too, if you have bought LCE in a specific camouflage pattern. All players, especially new ones, should also be wary of wearing all enclosing or thick skinned LCE such as assault vests as it is very difficult to feel hits through them. You must learn to tell when you have been hit from sounds and other signs, not so easy if you don’t yet know what it’s like to be hit! Wearing a pair of gloves is a good idea as it hurts when you get shot on the hand, cheap ones will suffice in the short term so long as you can still safely handle your airsoft replica. A hat or head wrap is advisable as headshots can hurt. Headgear will also improve your camouflage, but it is not mandatory. Be conscious of how a hat may interface with your goggles. When you start playing more seriously you may want to buy a waterproof ‘Gore-Tex’ jacket and a warm clothing layer, in case you get caught out in the rain or have to wait for game start in the cold. You will shrug off most of the effects of cold and damp when you exert energy in game, but if you really get caught out and become uncomfortable then you will find that your performance drops dramatically. Worst of all, you might cease to enjoy the game. First, find an airsoft site to go to. There are many excellent directories out there, including the one provided by Airsoft Nation. Next, book yourself in, usually by emailing the game organiser from their website. It is highly recommended that you drag a friend or two along to split fuel costs (you might get lucky and your friend might get into airsoft as well). 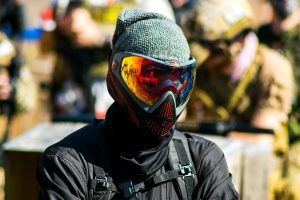 Don’t worry about bringing a big group of people like you often have to with paintball, in airsoft you will always team up with other players on site. 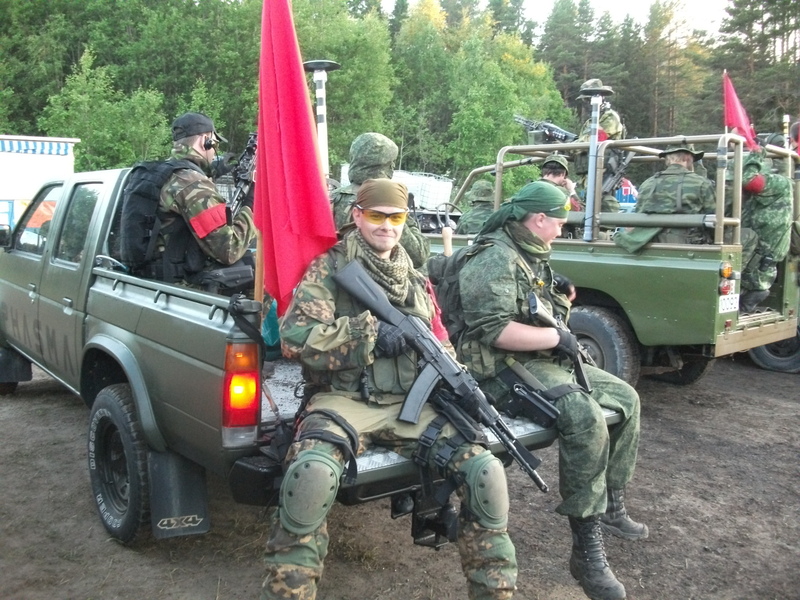 If your group doesn’t have access to a car, then unfortunately it may be difficult to play airsoft long term as airsoft sites are usually in the middle of nowhere. So it’s a Sunday morning, and you are off to your first game. This is the most important step you can take. So many people just never get as far as going to a game. There are thousands of people who waffle endlessly about how they are going to play airsoft, but lack the enthusiasm to go to a game! Once you get there you will want to go again and again, but the thought of getting up early on a Sunday and spending £40 on a day out can stop many people coming, even if they have booked in. If you sacrifice one otherwise wasted Sunday and commit less cash than a night out, you will quickly find yourself part of an enriching, rewarding hobby where you will meet (and shoot) some great people and have some memorable adventures! Bring a bottle of water and some lunch if food isn’t provided. You will certainly need to drink water throughout the day even if it’s cold out. Try and turn up before 9am. Game briefings usually commence at 10am, so this gives you an hour to chat with the local players, and if you’ve requested a “hire gun” – be issued with your replica for the day, load up and fire a few times on the range. At around 10am, the head marshal will brief everyone for the day. It is very important that you pay attention to this brief, as they may mention game and safety rules that are unique to that site. Safety briefing and first game setup should take no longer than half an hour. Usually you will have an hour break for lunch, food is sometimes provided. Depending on how hard games have been the staff will usually call it a day between 4pm and 5pm. The players are usually tired by this point and beginning to pack up anyway! At a minority of sites you will stay away from the safe area all day, or more often not return to it till lunch. Ask one of the Marshall if this is will be the case, if it is then you will have to take all of your stuff with you. At a few small sites you will may be returning to the safe area after every game. Never load your replica in the safe zone, and always wear goggles when in the playing area. Marshals will direct you and you must always obey their commands. If in doubt, have your goggles on and replica unloaded. When testing an unloaded AEG to see if the battery is working always cover the muzzle by poking it into your boot or your kit. We will refrain from explaining in great detail the rules most sites employ, but the one thing to bear in mind is to not shout “Man down!” whenever you have been eliminated in a game. “Man down” is an emergency call almost always reserved for when a player has become injured during a skirmish, and requires medical attention by the on-site first aider. When this is called, you will often hear a shout for “ceasefire” which will require you to make your replicas safe. You must follow the direction of the marshals when it comes to safety. 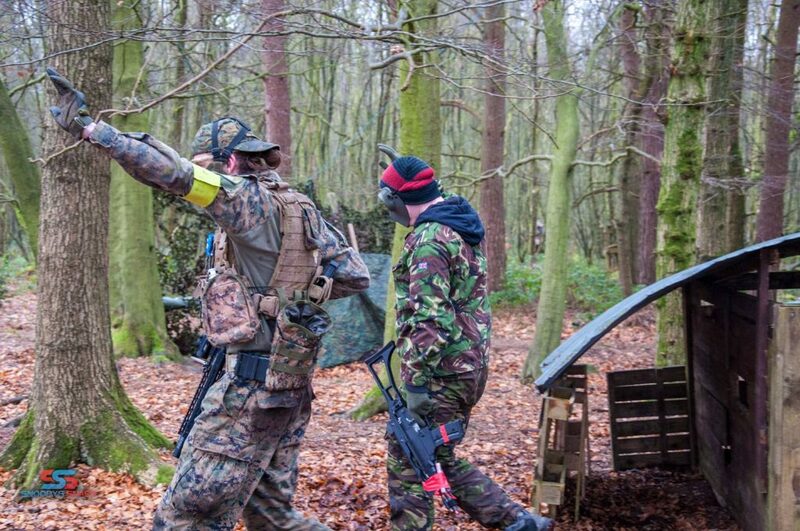 To take the next step into airsoft skirmishing please take a look at the links on our website and look at joining UKAPU. We can’t continue to support and encourage new players without players supporting us. All of us at UKAPU are out there fighting for airsoft players rights. If you have any comments on this guide please do not hesitate to let us know. Any positive comments will happily be accepted and any negative comments will be begrudgingly accepted and we’ll try to figure out how to take those comments on board. Although many people will display an interest in airsoft, very few of them actually have the confidence and motivation to turn up to a game. 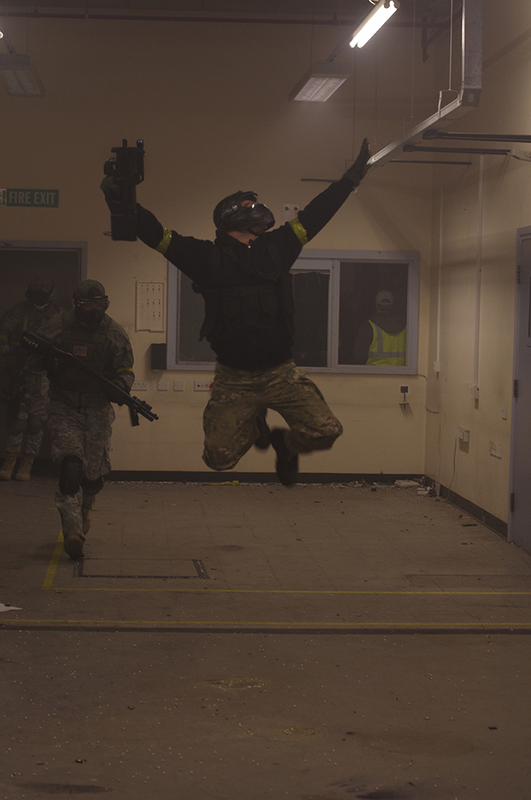 We at UKAPU hope you take the plunge and attend an airsoft game one day – and who knows, maybe you’ll stay, maybe you won’t, maybe you’ll become a rather valued member of our amazing community. Originally by Matt Furey-King and painfully curated by David Weston and the rest of the UKAPU committee, with images from UKAPU members past and present (including the curator and his friends), Graham and Darwin from Airsoft Nation, Snoopys Snaps and Airsoft Addict. We hope you have not fallen asleep too many times.